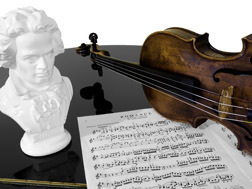 Take a look into the reasoning behind the success of Beethoven and his Sonatas. It was said that Beethoven was very detailed in the arranging of his music. The Sonata was one type of many of Beethovens' masterpieces, yet it took him ample time to make sure they were just right. In this video, viewers will be able to experience what Beethoven went through in the journey of perfecting this particular type of musical arrangement. Every piece of Beethovens' music had much thought and energy behind it. Since the Sonata is a particularly complex piece, it is said that Beethoven relished his time composing them. In this video, audiences are presented with example cases that will help to understand the thought process Beethoven went through. Audiences are also given a performance at the closing of the DVD. This interesting and informative video runs for 28 minutes.